Are you worried about VPN scams? Trust me – you are not alone. With increasing public interest in Internet privacy and security, VPNs are becoming more and more mainstream. Unfortunately, there are shady characters who use this as an opportunity to profit from unsuspecting victims. I’d like to share some tips on how to spot these VPN scams. With rising concerns over Internet privacy and security, it is smart to invest in a good VPN (see my guide for the Best VPNs of 2019). Be warned: you need to exercise caution when choosing your VPN provider. The VPN market is riddled with scams and fake VPNs. How can you protect yourself from these VPN scams? 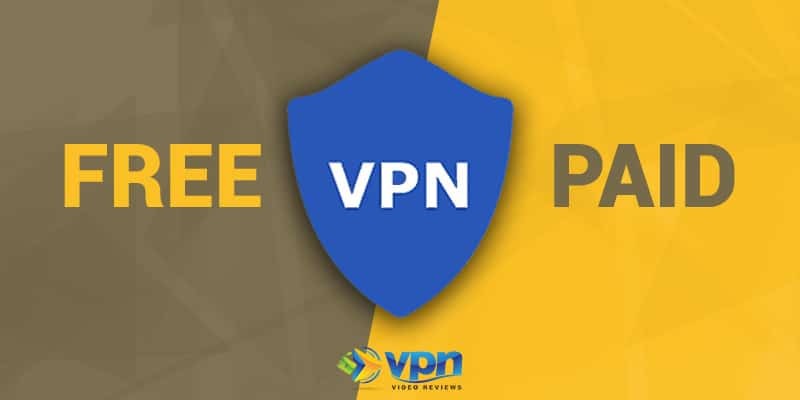 In this article, we cover 10 VPN scams you should be aware to help you choose a VPN provider that guarantees Internet privacy and security. Looking for a VPN that isn’t a scam? Hundreds of thousands of people, including me, use ExpressVPN to secure their online activity. You know how the old saying goes: nothing in life is truly free. This is especially true for VPNs. Free VPNs are pretty much the top scam to watch out for. Simply put, they are the direct antithesis of what a VPN is supposed to do. When you use a good VPN, you have peace of mind knowing that your Internet data will not be sold to advertising firms and marketing agencies by your ISP. But this is exactly what free VPNs like Hotspot Shield VPN do – they log your Internet activity and sell it to 3rd parties for the purposes of building your advertising profile. For more information on this topic, check out my article comparing free VPNs against paid VPNs. 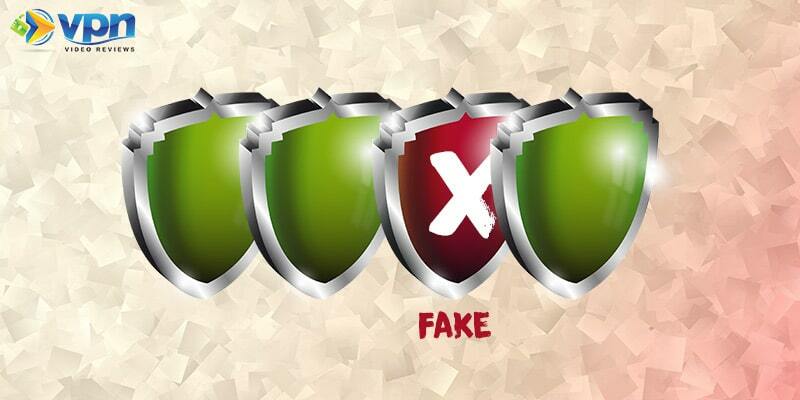 Apart from free VPNs (which are one of many fake VPNs), there is more to consider when it comes to identifying a genuine VPN from a fake VPN. For reference, I define a “fake VPN” as a VPN that engages in activity that goes against the idea of security and privacy. We can take this case with Hola VPN as an example. Hola VPN secretly used its customers’ devices to create a botnet, essentially allowing others to free-ride off their Internet bandwidth. Permission to do this was hidden in the fine print and as you can imagine, people weren’t too happy. Other fake VPNs can be more hostile. Remember: when connecting to a VPN, they have the ability to see all your Internet activity – sometimes including bank details – and can easily relay information back to you such as ads, spam emails or ransomware threats (click here for more information on the dangers of using fake VPNs). The best VPNs are transparent in their goals, where they operate, and the type of encryption they use. Make sure you read through their terms of service carefully and do your research to determine if the VPN service you’re looking to purchase is legit. Never trust reviews and ratings on mobile app stores. Take Betternet VPN for example – the free VPN service has over 12.2 thousand ratings on the Apple App Store and has 4.6 stars. Unfortunately for the 12.2 thousand users that ranked Betternet, they were probably clueless to the fact that Betternet VPN is among the worst VPN providers out there according to the Commonwealth Scientific and Industrial Research Organization (CSIRO) in Australia. When choosing a VPN, be thorough in your due diligence and review expert websites and opinions rather than trusting the opinions of unaware users on the Apple and Android App markets. Check your research against this list of essential VPN features and if you’re still not sure, you can fall back on the VPN that I personally recommend: ExpressVPN. You should always be skeptical of the statement “we don’t collect, log, or store any identifiable personal information of users.” More than likely, your VPN is lying to you. Don’t rely on false promises of anonymity. Direct your attention to transparency, trust, ease of use, performance and reliability in a VPN. Unfortunately, even the best VPNs claim to have no logging policies and use them to promote their service. Even if a VPN provider does commit itself to no-logging, its likely that the owners of the servers VPN providers lease do. Therefore, when choosing a VPN provider – even a highly recommended one like ExpressVPN – read the fine print and look for any contradictions in statements of no-logging policies. If data is logged, how will it be used? Will it be used to benefit service, or will the provider sell you out to 3rd parties? We should not focus on false promises of anonymity and instead direct our attention toward transparency, trust, ease of use, performance and reliability in a VPN. Similar to being skeptical of VPNs that deny logging user data of any kind, you want to be cautious of any provider that boasts about being the fastest VPN on the market or has the best encryption. If you have seen any of my video reviews of VPNs, you will notice that in the speed tests that no provider stands on top of all the others and speeds vary greatly based on factors such as distance to the nearest server or the time of day you are logging on to the service. Therefore, if a provider claims they have the fastest VPN speed on the market, not only are they being dishonest, but ultimately they are using this as a promotion tactic. The same goes for encryption. You should always dig deep into the encryption used by different providers and determine if it is in fact as “state of the art” as they claim. 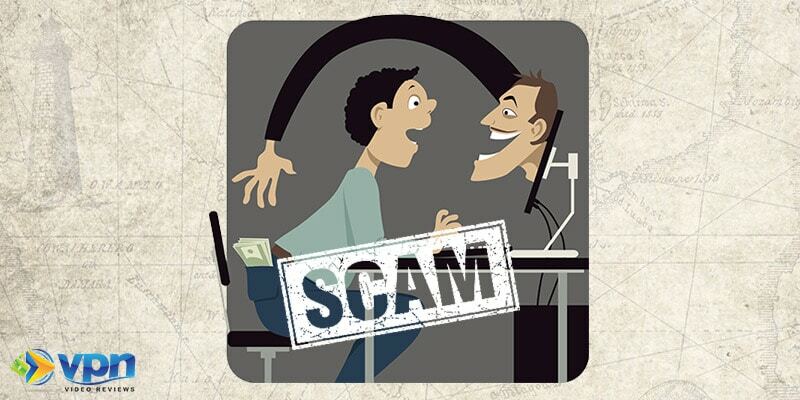 Do not fall for scams where you either pay an enormous sum of money or absolutely nothing for service. When reviewing pricing, be sure to also know how much you will pay and when you will be billed. 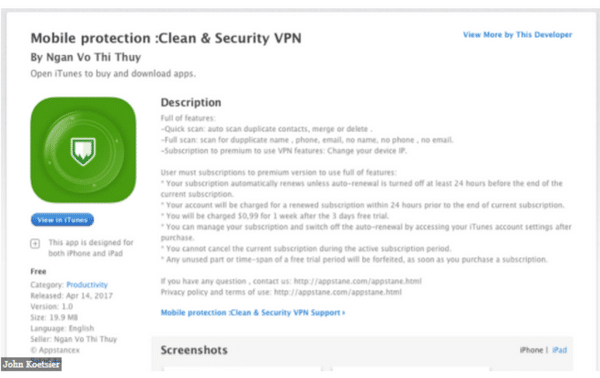 200 users fell for paying a $400 per month service fee in a crazy scandal involving an app called Mobile protection :Clean & Security VPN (notice the typo in the title). The app claimed to charge users $0.99 a week for the premium service, among many other major lies. Along with the misprint in pricing, the product description is riddled with grammar mistakes which should immediately cast doubt on the validity of the service. That did not stop 50,000 people from downloading the service, though. Before subscribing to a service, first make sure it is genuine and also shop around to get a feel for how much a competitive VPN will run you. Most VPN services bill you either monthly, bi-annually or annually. It’s rare for a VPN service to bill you weekly. 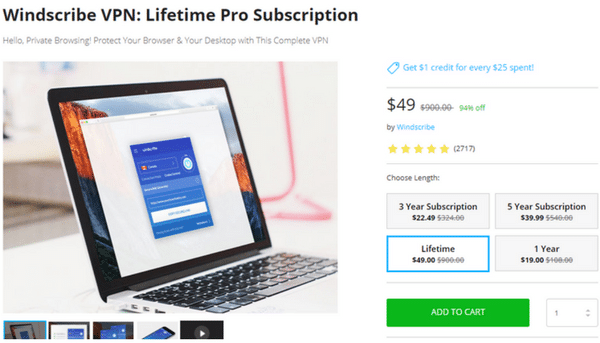 Most legitimate VPN services will cost you anywhere between $40-$99 per year. I have no idea how Apple originally approved this app for its app marketplace, but even after its deletion, many other scam apps like this remain. Other scammers are more careful with their words. Another way to gauge a quality VPN from a scam is checking whether the VPN provider website is secure. Take MySafeVPN as an example, a sham provider whose website was not secured with HTTPS (HTTPS encrypts communication whereas HTTP does not). If a VPNs website isn’t even secured, how can you trust that it’s service will be? Taking a moment to see if the VPN provider website is secured with HTTPS in the website URL can help save you from falling for a scam. If a VPN does not encrypt their website, you can bet that any promises of anonymity and being “state of the art encryption” are false. Not only does MySafeVPN not encrypt their website with HTTPS, but they also lied about an affiliation with Plex, a popular media server app, using Plex’s email list that MySafeVPN most likely purchased on the black market. Lifetime subscriptions advertised on third party websites are another common VPN scam to look out for. When logging on to websites like StackSocial and Gdgt Deals, there are endless amounts of products advertised with lifetime subscriptions. Take the graphic below I took from Gdgt Deals for example. The deal offers a lifetime subscription to Windscribe VPN for $49.00 and also advertises the original price of $900. The price is so low that there has to be a catch….and most likely there is. Remember that quality VPNs experience high overhead costs and pass those onto their users to make profits. So how would Windscribe VPN be able to survive as a business if it is offering an unlimited subscription at a price that would generally give you a year of service with an average VPN on the market? If you ask me, Gdgt Deals ad for Windscribe VPN’s lifetime pro subscription has scam written all over it. In fact, when logging onto Windscribe VPN’s website, there is no lifetime subscription even offered. Remember, good things in life are not cheap and quality Internet privacy and security that last a lifetime are priced well above $49. The VPN market has become saturated with many poor and phony providers in recent years. Complicating matters more are sham VPN review websites launched by VPN providers to promote their own service. Remember that VPNs are an industry where trust matters and you do not want to blindly trust some random review without researching the author’s background. Therefore look for reviews from transparent sources (does their “About Page” actually list a person’s name?). On my website about page, I try to be overly transparent about who I am, why I am concerned with Internet privacy and security, and my commitment to helping others with the same concerns. When reading reviews, try to decipher the purpose of the article. If it is trying to sell you the VPN service rather than educate you on it, STOP. Look for a separate review of the product. Good reviews will also tell you what is bad in addition to what is good about the product. Watch out for VPNs that require too much of your private information. Astrill, for example, is a popular VPN service that requires users to register their address and phone number to use the service. This is a red flag for the purpose of a VPN is to not have your personal identity tied to your account. If anonymity is a primary concern for you, steer clear of VPNs that ask you to enter too much of your private details. Another tip is to look for VPNs that accept Bitcoin as a form of payment to further distance your identity from your account. Rising public concerns on Internet privacy and security have been met by an onslaught of VPN scams. You should be alert for these scams whenever you’re looking to purchase a VPN. 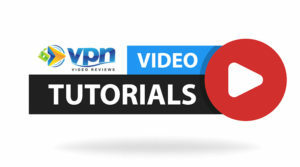 Apart from the tips listed above, the best way to avoid VPN scams is to use multiple genuine sources to thoroughly review any VPN provider prior to subscribing. Are you looking for some quality VPN recommendations? Check out our list of trustworthy VPN services or give the one I use a try: ExpressVPN. Are there any other VPN scams you have noticed? Please share your thoughts in the comments below. I joined windscribe couple of years ago and got a lifetime membership for about 30 bucks at that time. It’s been a pretty decent provider and I haven’t spent a penny more since. About a year ago they added the ability to get Netflix UK and Netflix US so that shows they are trying to keep on top of their game. Thanks for sharing your experience, Jason! I hope it continues to work out for you, but consider this: how many companies do you know that can offer a service indefinitely at a high quality without recurring revenue? They are getting money somewhere, and my guess would be that they’re selling your data or doing something else to get it. Signed up for the Fltr and got free VPN for life with Passel.io Forcefield. no support. they seem to ignore every plea for help. their service slows my connection way down no matter what server I tie to. they seem to be a fraud. Avoid.